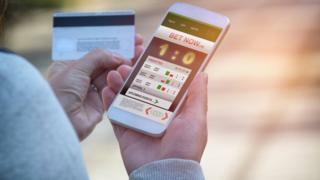 Premier League football clubs should do more to help tackle gambling addiction, the head of NHS England has said. Simon Stevens described gambling addiction as one of the "new threats" facing the NHS and said reports that foreign betting companies weren't "co-funding help" for addicts were "deeply concerning". Independent charity, Gamble Aware, said the relationship between sport and gambling had "reached a tipping point". The Premier League declined to comment. Mr Stevens said the NHS would be contacting the Premier League to ensure companies that sponsor top clubs "do the right thing". Nine Premier League teams are sponsored by betting companies. An estimated 430,000 people in the UK have a gambling problem. Betting companies who profit from the industry in Britain have been encouraged to donate money to the charity Gamble Aware, with a total target of £10m a year to help to treat addicts. However, a number of foreign gambling companies that sponsor Premier League clubs have not donated this financial year, The Sunday Times reported in July. These included Fun88 (Newcastle) and SportPesa (Everton). Speaking at the Health and Care Innovation Expo in Manchester, Mr Stevens said: "There is an increasing link between problem gambling and stress, depression and other mental health problems. "Doctors report that two thirds of problem gamblers get worse without help and the NHS does offer specialist treatment. "But reports that foreign gambling companies are failing to play their part in co-funding help for addicts are deeply concerning. "Taxpayers and the NHS should not be left to pick up the pieces - the health of the nation is everyone's responsibility. "The NHS will now work with the Premier League on how we persuade these foreign gambling companies to do the right thing." This season, ManBetX - an online betting site in Malta - is the official shirt sponsor of Crystal Palace, while Phillipines-based Dafabet is Fulham's official team sponsor. Why are most problem gamblers men? Mr Stevens said the NHS needs to get "more serious about aspects of prevention in public health, including what you might call 'the new public health"'. Around 370,000 11 to 16-year-olds spent money on gambling in the course of one week in England, Scotland and Wales, according to a report published by the Gambling Commission last year. The regulator estimated that 25,000 of them were problem gamblers. A spokeswoman for Gamble Aware said it welcomed the speech by Mr Stevens. "With nearly half the clubs in the Premier League, and over two thirds of the Championship League sponsored by gambling companies, we are seriously concerned the relationship between sport and gambling has reached a tipping point. "We would like to see all clubs, leagues, and broadcasters who profit from gambling work with us to help fund treatment for this hidden addiction." Dr Henrietta Bowden-Jones, spokesman for the Royal College of Psychiatrists, said: "We certainly want gambling companies to do more to help people with gambling problems. "The fact is addiction is a severe mental illness and, while some pioneering services like the National Problem Gambling Clinic have been set up, generally addiction services in this country have been stripped to the bare bones. She added: "We urgently need to find ways for people with gambling and substance use disorders to get access to high-quality treatment."